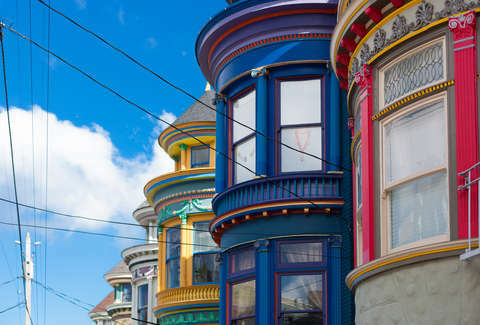 It can get tiring to repeatedly hear how expensive rent is in places like San Francisco or New York. It's expensive. It's really damn expensive. However, it can be complicated to contextualize rent in one state versus another and to understand how much you need to earn to afford that rent. A new map from HowMuch.net attempts to provide a little context. 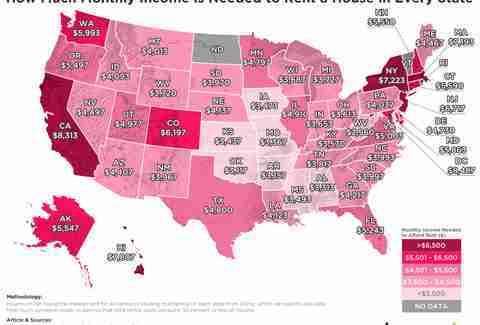 The map shows the amount of monthly income a person needs to rent a house in each U.S. state. To arrive at the numbers, the site used research tools from the housing website Zillow. It calculated the average price of rental property in each state, including multi-family homes. Then it "used the rule of thumb that housing costs should be no more than 30% of net income," which is income before taxes, retirement contributions, or other things that might be taken out like transit perks or an FSA. Of course, there are subtleties that this methodology glosses over. For instance, rent in, say, Kingston, New York will be cheaper than New York City and to average at a state level will erase those differences. Nonetheless, the map provides an interesting broad overview of how these numbers vary across the nation. Here are the 10 most expensive states (which includes Washington D.C.), according to HowMuch.net. It's an interesting partner to the site's recent look at the states where it makes more sense to buy than rent. It also serves to highlight a few of the many housing issues in the United States. In California, for example, the average house requires the renter to make just under $100,000 per year. Even though, as HowMuch.net points out, the average income in California is high compared to other states, it's not $100,000.